Our first responders, police, firefighters, and paramedics are on the front lines for us every day. Many perform way beyond the call of duty. Acts of heroism are often unacknowledged. Walter Clark Legal Group would like to honor our first responders, with your help. Tell us about your local hero, and why they deserve to be honored. 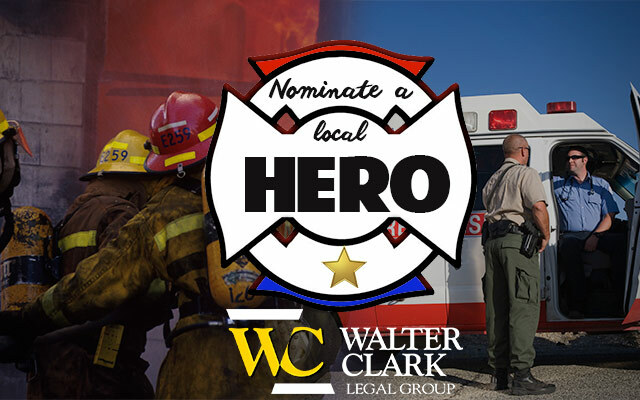 Each month, Walter Clark Legal Group will honor a hero with a $500 award for their service and selfless giving. Submit your hero’s story below. And to all our 1st responders, thank you…from Walter Clark Legal Group. Triple Crown Kentaco Derby Pool Party Billy’s $1,000 Winning Word!